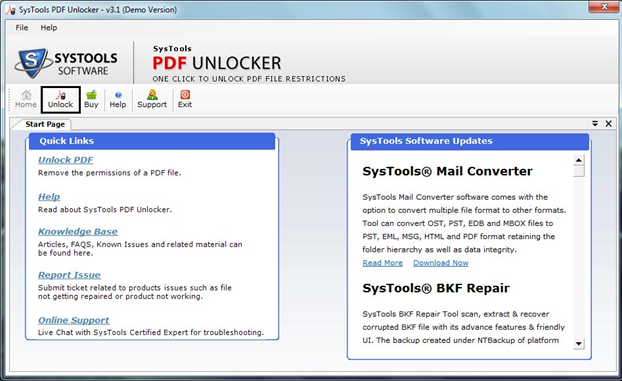 Home » Software » Why You Should Invest In PDF Unlocker Software? Why You Should Invest In PDF Unlocker Software? Phones, computers, laptops, and even the files saved in them are nowadays preferred to be protected with the password. Reason being, it gives the owner a sense of contentment that the data cannot be accessed by anybody else without their permission. To some extent, such theories prove to be quite helpful but there are times when passwords can actually trouble the user. For example: To make our passwords unique so that no one can crack them, we generally generate an alphanumeric code that can have upper or lower case characters. Just imagine that you forgot the password! Now what? In the case of PDF, there is a special kind of password protection that is set to assure that no one can misuse the file data. Usually, what we do is we set open document password. This means unless the security code is entered, the file cannot be opened. In the case of Adobe PDF, this is termed as User Password. Another type of protection is a master password where anyone is allowed to open the file, but is restricted to make any changes in it. For example, it is not possible to copy, print, or edit the contents of the file. This is called Owner Password for Adobe PDF file. 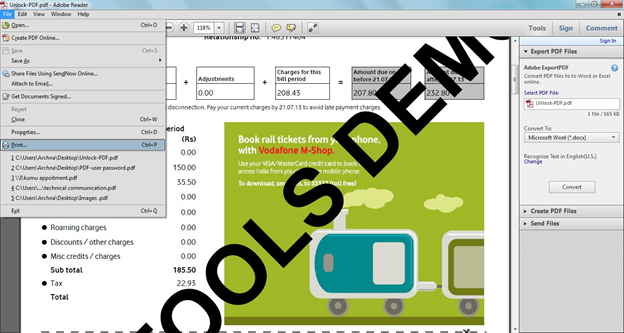 To rescue such scenarios, there are tools available online that can help to remove password from a restricted PDF file. 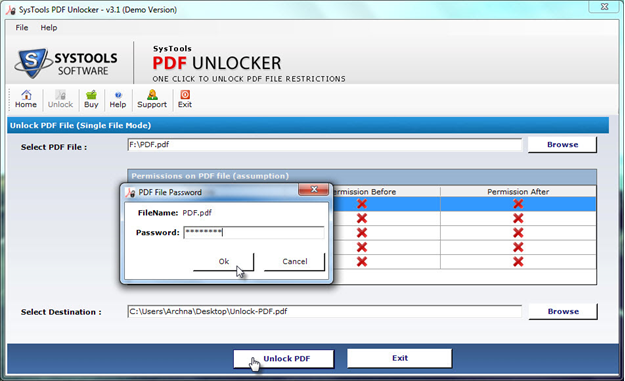 We are going to discuss one such tool here which is named as PDF Unlocker software. Remove Local Security from PDF File: Edit, Print, Copy, and Extract restrictions set on PDF file can be eliminated with the tool. The software makes PDF file free from owner password while keeps the source PDF absolutely intact. Unlock PDF with Open Document Security: The software helps to make PDF file free from user password. Add the file to the tool and provide a password when prompted. The tool as an output will provide password free PDF file. Eliminate PDF Security from Multiple PDF: With Personal License of the tool, only one PDF file can be processed. However, with Business and Enterprise license, multiple DF files can be unlocked in single running instance of the tool. Preview Permissions on PDF File: Once PDF file added to the software, it displays the list of permissions that are set on the file. Under the before and after column, the status of permissions can be checked out by the user. 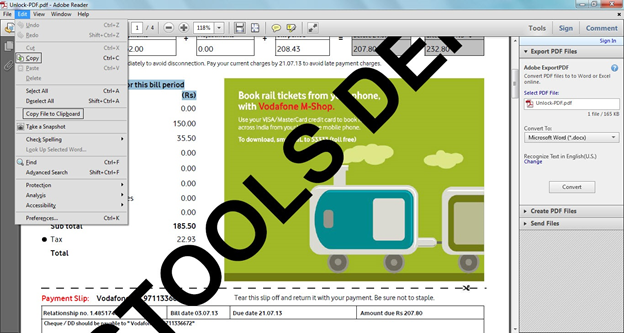 Test Sample: I am testing this tool against a mobile bill that has both owner and user password set to it. For the purpose of evaluation, demo version is being used that works like its complete version but leaves a watermark across the PDF file. 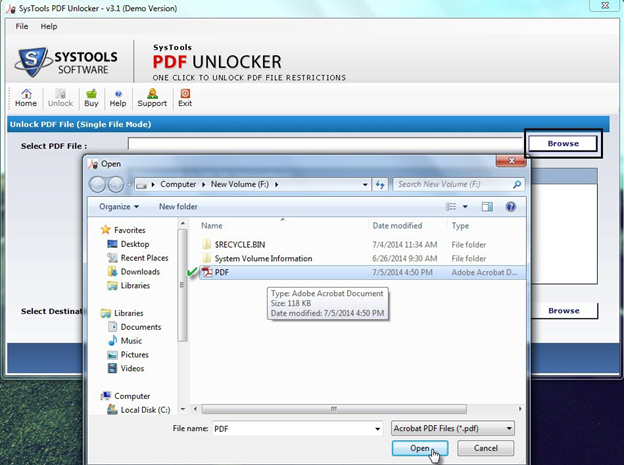 Step1: To start up the PDF unlocking process, the first step is adding the file to the tool. On the welcome window of the tool, click on the “Unlock” button from the menu bar. Step2: To select the PDF file from the system that is to be processed by the tool for unlocking, click on the first “Browse” button. Now, move to the system partition where PDF file is saved. Select the PDF and click on “Open” button to add the file to the tool. Note: Make sure that the PDF file is in the healthy state. If the file is corrupt, first repair it, and then use the tool. Step3: Click on the second “Browse” button to provide a destination location where you wish to save the output PDF file which is free from owner and user password. After this, click on “Unlock PDF” button at bottom of the window. Step4: The selected PDF file has a user password set to it and thus the software is prompting for user password. Enter the password in the text box and again click “Unlock PDF” button. Step5: When the PDF file is unlocked, the software will inform about it through a message. Click OK.
Step6: Click on the “Exit” button to move out of software running instance. The software will confirm if you want to exit the tool. Click “Yes” to confirm. There is no need to enter any password to open the PDF file. This means that the PDF is free from user password now. The PDF file is free from restrictions to copy, edit, print, and extract contents of the file. Final Verdict: Yes or No? 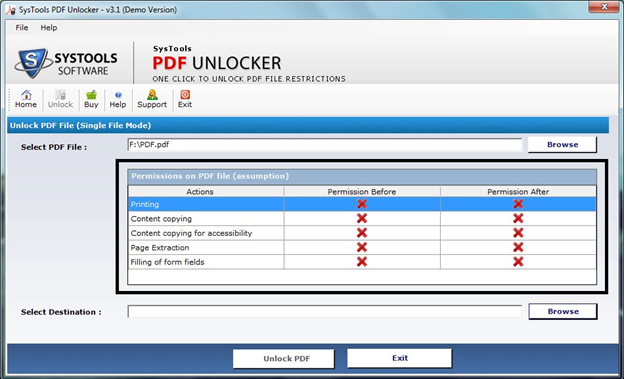 Definitely, PDF Unlocker Tool to unlock PDF file is a Yes if the user wishes to eliminate owner and user password restriction without Adobe Acrobat. The features and ease at operability in the tool makes it a worth investment solution. In addition to this, the most interesting point oft the tool is it keeps the locked file intact and creates a new PDF file that is free from both owner and user password.